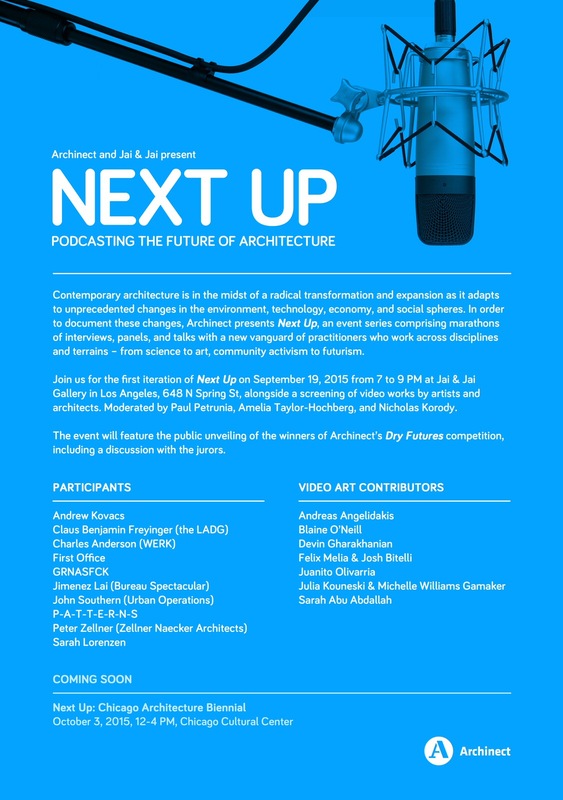 Archinect presents Next Up: Podcasting the Future of Architecture at Jai & Jai Gallery, Sat. Sept. 19! Archinect is pleased to invite you to the first iteration of a two-part live-podcasting event, Next Up, at Jai & Jai Gallery in Los Angeles! From 7-9PM on Saturday, September 19, we’ll be conducting a series of live interviews, panels, and talks with local architects at the forefront of a rapidly changing field. Today, architecture is in the midst of a radical transformation and expansion as it adapts to unprecedented changes in the environment, technology, economy, and social spheres. Next Up is the first of an ongoing conversation with some of the figures helping to shape that change, and their take on the forces predicating it. In Los Angeles, perhaps no issue more dramatically pertains to our urban future than water scarcity. Join us as we address the on-going California drought with the first public announcement of the winners of our Dry Futures competition alongside a conversation with the jurors. In an adjacent space, we’re screening a series of video works by architects as well as by artists whose work pertains to the evolving nature of our cities and the forces that make them. Increasingly, the lines between architecture and art are being blurred, as ideas cross-pollinate and tactics are borrowed. Jai & Jai Gallery continue their work in the borderlands of these fields, with BUST, an impressive show of classical busts reimagined by architects, on-view in their main space concurrently with Next Up. If you can’t make it out to LA, you can always catch-up at the second Next Up at the Chicago Architecture Biennial on October 3rd! Can’t make that either? Have no fear! We'll be podcasting both, so keep your eyes open for the live recording on Archinect soon.